800-630-4283, a Web Direct Brands Site. Please Note: Additional shipping charges may apply for large dimension dunnage racks. We will contact you upon completion of your order if necessary. * If the length of your dunnage rack exceeds 4 feet, click here for additional information. 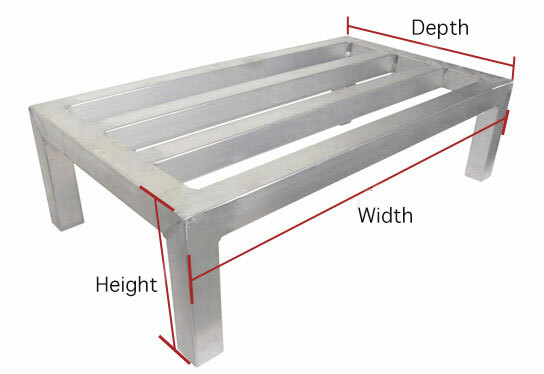 ** Depending upon your specific dunnage rack needs, additional customizations may be available. Contact us to learn more. Our dunnage racks are constructed from 6061-T6 rust free wrought aluminum alloy. 6061-T6 wrought aluminum is a high-grade alloy with yield strength of about 35,000 pounds per square inch. For comparison, this is much stronger than “mild steel” which has yield strength at about 20,000 to 30,000 pounds per square inch. 6061-T6 wrought aluminum is used for the purpose of durability and resiliency, providing a quality that won’t easily dent, won’t rust, and can be used in any storage environment. Our staff has been welding aluminum for over 10 years. Each dunnage rack is custom made to your specifications by American welders. Constructing our racks in the United States gives us upmost control over quality standards and also allows us to produce these racks custom per order, something you will not find through any other dunnage rack supplier. Our staff is available for questions 7 days a week from 9am to 9pm Eastern Time for questions in regards to the construction/materials, usage and website. Orders can be placed over the phone during office hours 9am to 7pm Eastern Time Monday - Friday, and 9am - 5pm Eastern Time Saturday. Our dunnage racks are constructed from 6061-T6 rust free wrought aluminum alloy. 6061-T6 wrought aluminum is a high-grade alloy with yield strength of about 35,000 pounds per square inch. For comparison, this is much stronger than “mild steel” which has yield strength at about 20,000 to 30,000 pounds per square inch. Our staff has been welding aluminum for over 10 years. Each dunnage rack is custom made to your specifications by American welders. Constructing our racks in the United States gives us upmost control over quality standards and also allows us to produce these racks custom per order, something you will not find through any other dunnage rack supplier. Our staff is available for questions 7 days a week from 9am to 9pm Eastern Time for questions in regards to the construction/materials, usage and website. Orders can be placed over the phone during office hours 9am to 7pm Eastern Time Monday - Friday, and 9am - 5pm Eastern Time Saturday. © Copyright 2002-2019 Web Direct Brands,Inc.